Dear players, welcome to legendary MMORPG League of Angels II at game platform Infiplay! Exciting adventures, mysterious angels, brave knights, world of legends and many more are awating you! For many years chaos reigned at blue planet Sapphire, but once beautiful angels descended in the humans world and imprisoned bloodthirsty demons in the Abyss. Long power struggle has been divided the angels into three independent kingdoms: Tempest Empire, Celestial Empire and Midas Empire. Ancient relic which saved peace in Sapphire was stolen and demons broke free. Huge danger threatens the blue planet! On whose side will you fight? Destiny of Sapphire in your hands! Choose your kingdom, become the leader of own angels league and enter into battle with terrifying darkness forces to save the world from doom! Deluxe graphics with 3D characters, dizzy special effects and excellent sound accompaniment are awaiting you! Appreciate the winged beauties and their powerful spells! Find out all subtleties of exciting story about three angelic kingdoms confrontation! All characters have their own nature and history, they are binded with difficult relationships from which is depending your team power! Overcome the new most dangerous and enigmatical dungeons with fire-breathing dragons, frost giants and other hell monsters. Obtain a mythical victory and deserve the gold laurels of supreme warlord! Create an unique skills and abilities combination with your heroes, choose the best heroes formation and mount skills to fight with enemy hordes! Make a strategy which will gift you victory! Lead your own angels league and receive a blessing in chosen angels kingdom from supreme angel — Moira, Fortuna or Athena! Become a legendary hero of Sapphire and save this world from darkness! 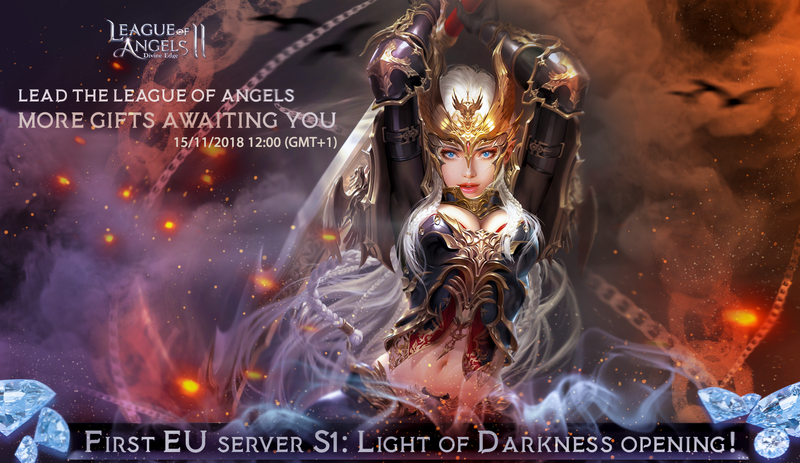 First EU server in League of Angels, S1: Light of Darkness, will be opened tomorrow, 15/11/2018 12:00 (GMT+1). Begin your game and get ultimate power from Light of Darkness artifact! League of Angels II is awaiting for you, hero!